Leo Fernandes netted the deciding score and the Cosmos prevailed in Florida. Winger Leo Fernandes headed in the game’s lone goal as the New York Cosmos defeated the Fort Lauderdale Strikers 1-0 in the North American Soccer League Spring Season opener for both teams at Lockhart Stadium Saturday night. 11,629 fams attended the match, a Strikers record for the modern era. Cosmos winger Walter Restrepo served a perfect corner to Fernandes, who powered his header in from just outside the six-yard box in the 58th minute. "The team showed a lot of character and personality tonight," Cosmos head coach Giovanni Savarese said after the match. "We were able to battle and keep a clean sheet in a game that was very difficult. We looked like a team that was ready to step onto the field and battle." Spanish legend Raúl went 53 minutes in his Cosmos regular season debut before being replaced by Sebastián Guenzatti. The Real Madrid star nearly caught up to a teasing back-post cross from Fernandes in the 34th minute to open the scoring. Raúl was taken off for precautionary reasons after experiencing some discomfort in the second half. "We want to make sure we don't push our players," Savarese said. "We felt it was better for him to come out. It's important for him to be ready for the next game." 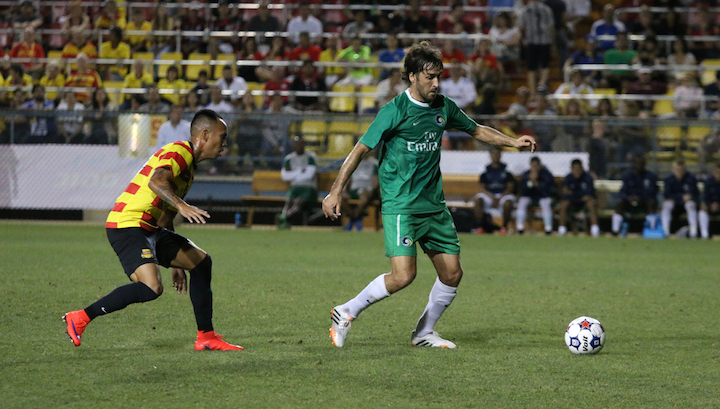 Against one of his former teams, Restrepo was particularly dangerous in the attacking third as the Cosmos stretched their unbeaten streak over Fort Lauderdale to six games in the modern era. Their only draw came last year at Lockhart Stadium. â€‹"It was an important one for us to start on the right foot," said Savarese of the season-opening win. Fernandes, a North Babylon, N.Y. native on loan from the Philadelphia Union of Major League Soccer, also proved dangerous throughout the match. Scoring his first regular season goal for the Cosmos was something special. "It's an amazing feeling," he said. "Ever since I joined the Cosmos I've been very happy. It's great to score in my first game." Immediately after the game Fernandes spoke to his father. "He told me he probably won't go to sleep tonight," said Fernandes. "That's how excited he is. It's a great feeling to keep him awake." Brazilian midfielder PC nearly scored first for the Strikers when he split a pair of defenders in the 38th minute and put a shot from 16 yards out on frame. But Cosmos goalkeeper Jimmy Maurer dived to his left to parry the attempt away. In the 67th minute Cosmos midfielder Marcos Senna unleashed a low shot from distance that was just wide left of Fort Lauderdale goalkeeper David Meves' net. The Strikers nearly equalized in the 75th minute, but Brazilian midfielder Leo Moura put his free kick from 27 yards off the outside netting. Maurer made another big save four minutes from full time to keep Strikers forward Dani Sanchez from netting an equalizer. "He showed a lot of maturity," Savarese said of his second year goalkeeper. "Playing as a starter last year made him grow. He's more settled in the role. He had a very good match today. He looked very secure." Meves robbed Guenzatti of an insurance goal in the 90th minute when he saved the midfielder’s first-time volley off a cross from fellow midfielder Adam Moffat. The Cosmos had their best scoring chance of the first half in the first minute of stoppage time, but Meves saved Restrepo’s shot and Fernandes put a rebound off the post. The Cosmos remain on the road next weekend, facing Indy Eleven on April 11 at 7:30 p.m. ET.